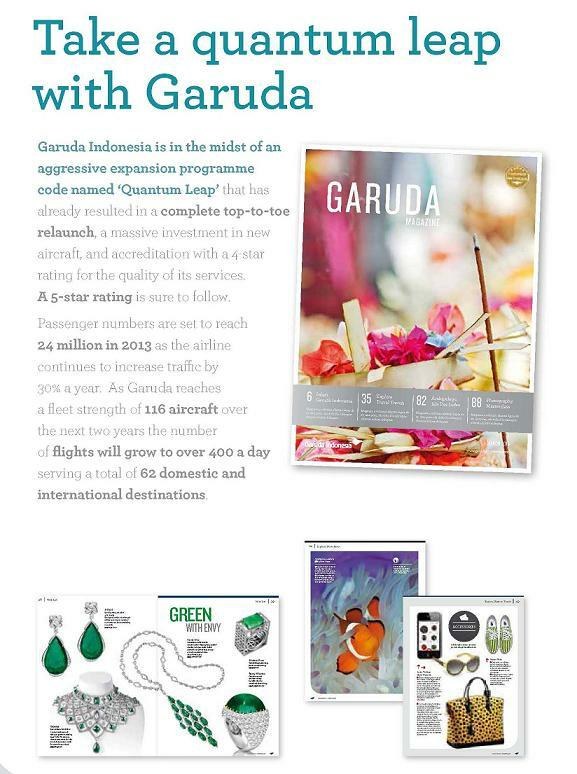 Garuda Indonesia is in the midst of an aggressive expansion programme code named “Quantum Leap” that has already resulted in a complete top-to-toe relaunch, a massive investment in new aircraft, and accreditation with a 4-star rating for the quality of its services. A 5-star rating is sure to follow.Passenger numbers are set to reach 24 million in 2013 as the airline continues to increase traffic by 30% a year. As Garuda reaches a fleet strength of 116 aircraft over the next two years the number of flights will grow to over 400 a day serving a total of 62 domestic and international destinations. With the airline’s drive to achieve a 5-star rating the in-flight magazine had been completely redesigned and repositioned to offer each and every passenger a truly first class reading experience. From March 2013 passengers can enjoy editorial and photographic content that grabs their attention from page one with rewarding articles of real value to a domestic and international readership. It is available in the seat pocket on all flights and in the executive lounges. It is also sent to members of the frequent flyer programme. A separate version of the magazine is produced specifically to appeal a passengers traveling to the Middle-East. As the national flag carrier Garuda is charged with serving and expanding the domestic route network across the whole of the Indonesian archipelago flying to 33 local destinations. 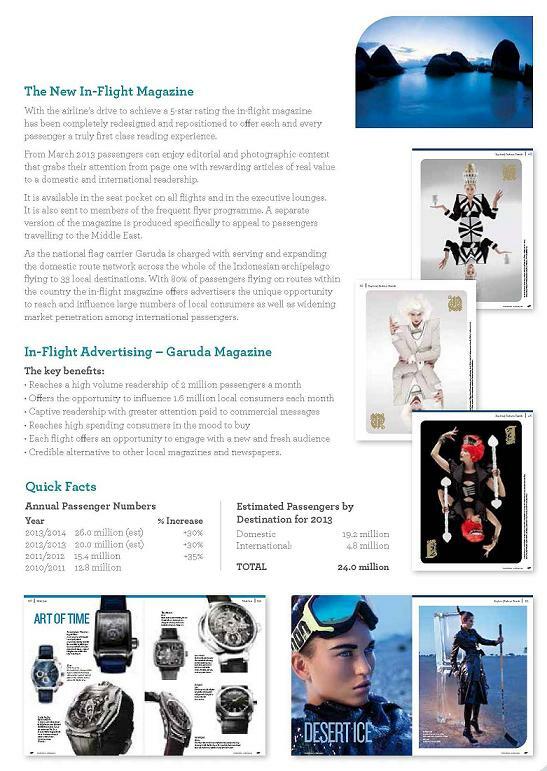 With 80% of passengers flying on routes within the country the in-flight magazine offers advertisers the unique opportunity to reach and influence large numbers of local consumers as well as widening market penetration among international passengers. The magazine is published monthly and is available in the seat pocket. This entry was posted in Majalah, 未分类 and tagged advertising agency, agency iklan, biro iklan, colours garuda, colours garuda indonesia, colours garuda indonesia magazine, colours garuda magazine, colours garuda magazines, colours magazine, harga iklan, iklan koran, iklan majalah, in-flight magazine garuda, inflight magazine, majalah colours, majalah colours garuda, majalah garuda, majalah garuda indonesia, majalah pesawat, pasang iklan, 印尼广告公司. Bookmark the permalink.